12 Year Old Drifter Slays Tires With Complete Confidence & Skills! - Muscle Cars Zone! 12 Year Old Drifter Slays Tires With Complete Confidence & Skills! Check out this amazing 12 Year old drifter burns tires with complete confidence and amazing skills! His name is Nikolass Bertans and his parents probably sat his in a drift car when he was 10 years old. 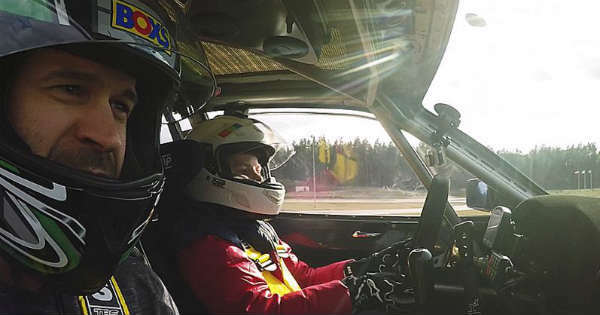 You could not believe how good it is on a drifting track, this 12 year old drifting prodigy from Latvia. This little kid was lucky because his coach is the drift legend Kristaps Blušs from Formula Drift. So, Nikolass now is really full-on competitive drift driver only on 12 years of age. He drives a BMW 3 E36 with a V8 engine under the hood ,fully prepared with a drifting suspension and tires. According to the video below Nikolass is very good at handling this powerful beast. As you can notice this little guy can barely see over his steering wheel, but he is still going perfectly sideways trough all the corners at the Bikernieki track in Latvia. He really impresses us with all those precise snapping trough the transitions. We can finally see how good he will be when he grows up and will be able to take part of Formula Drift or any other drifting championship in the world. We can not wait to find out. What about you?